Oreland Joe, First Mesa Maidens, Tennesse Marble, 31.5" x 12.5" x 8.5"
This is an exciting time for Native American sculptor and 2006 Prix de West Purchase Award winner Oreland Joe. 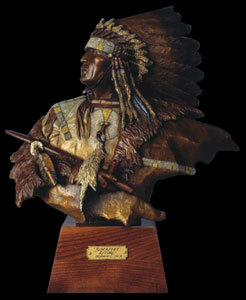 Indeed, Joe counts some of today’s top Western artists among his best collectors. Joe says they like the realism and the detail of the pieces. Currently, as well as working with bronze, Tennessee marble and alabaster, he has discovered a new kind of stone, Portuguese Yellow marble, that is fueling his unique creativity. Oreland Joe, Shepherds, Alabaster, 15" x 10.5" x 7"
Joe, who is part Navajo and part Southern Ute, naturally makes sure his pieces are culturally correct and accurate. To that end, he does extensive research and spends a lot of time drawing. Oreland Joe, Spirit Eagle, Alabaster, 13" x 11" x 5"
Not only is Joe meticulous about his research, he’s equally passionate about his raw materials. “I’ll buy alabaster in Utah or marble from a place in California that imports the stone from Europe. Before I buy the stones, an apprentice or I tap them with a hammer to make sure they ring. If they do, we bring them back here to the studio. “The marble that comes from Europe has already been aging for four or five months. 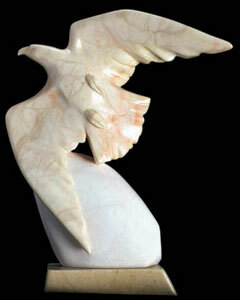 But the alabaster from Utah needs to set and breathe for two or three months. After that, it’s checked again by the apprentice. I’m looking for a solid stone because I do a lot of intricate work on face and hands and I’d hate to have a flaw. It’s like canvas—it’s ready to draw on, take measurements, head proportions, body proportions. 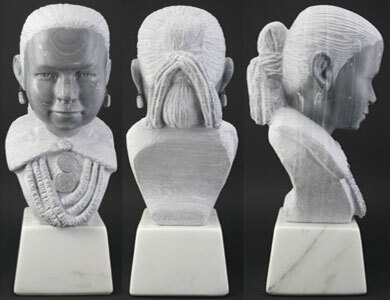 Oreland Joe, Navajo Girl, Italian Marble, 11" x 6" x 7.5"
Oreland Joe, White Dawn Prayer, Italian Marble, 32" x 10" x 8"
Oreland Joe, Whirlwind, Bronze, 16" x 9" x 6.5"
For Joe, it’s all about challenging himself and creating the best work he can. “It’s always improving the work—always pushing. Whether or not I make a good sale during the weekend, I’m still here Monday morning at nine." And for that, fine art aficionados everywhere are grateful. 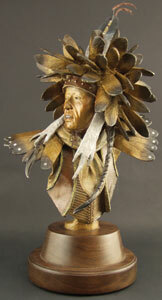 Oreland Joe, Blackfeet Ritual, Bronze, 16.5" x 14" x 6"